One of the first things I do for any project is to open up my online checklist for that project or task. If I don’t have one for that type of project, I create one. But few people I know use checklists. Or they may only use them infrequently. Have you ever missed a step while working? A step that caused you extra work later to correct? This is normal. We make mistakes every day. These are fairly common and easy to recover from. But what about more important mistakes? The Journal of Patient Safety estimates that more than 400,000 people die each year from medical mistakes in the US alone. Nearly EVERY one of these deaths was preventable! And these are highly trained people with vast knowledge who make mistakes because of the complexity involved in delivering care. Maybe your job isn’t as critical as a nurse, surgeon or other medical professional, but mistakes in your job can lead to lost customers, less respect from your coworkers and even dismissal from your job. Pilots use checklists before they take off to ensure a safe flight. A New England Journal of Medicine found that when surgical teams implemented a simple surgical checklist that patient mortality rates were cut nearly in half. If checklists help in such life critical situations as air travel and surgery, why not tap this powerful tool for your business and home life? Eliminate Mistakes: When we have done projects a certain way for so long, we become complacent. We assume we know what we are doing so we miss mistakes we wouldn’t make if we had to check off a box on the checklist for each task. Checklists save me from errors EVERY day. Help With Training: When you get to the point where you pass work to a virtual/personal assistant or others, your checklists make it much easier to train. The new person can easily follow the checklist as it is a step by step guide to what to do next. 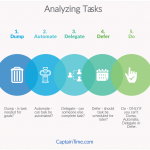 Automate: I have automated task list templates that make it easy for me to assign a new project to my team. See Creating and Storing Your Online Checklist below for the tool I use. More time, less mistakes and faster work – all great reasons I use checklists. Here are some of the activities I do that I have put into an online checklist. Speaking Gigs – when I am going to speak at a conference or workshop, I have a checklist to make sure I don’t forget anything important. It includes such things as all my AV equipment, a water bottle, throat lozenges, laser pointer, handouts, backup presentation on USB drive, and business cards. Creating an Online Course – I use this checklist to lead me through all the steps to creating a successful online course, from research, outlining, graphics, signup page, and additional resource tools I can create for my students. 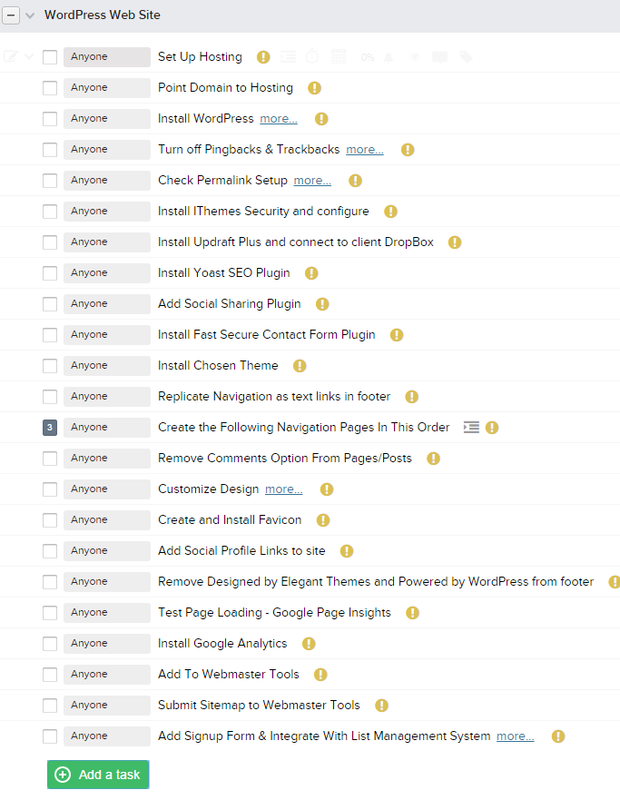 Creating a WordPress web site – when I create a WordPress site for my clients, my checklist has a step by step plan to set it up. Everything from getting the domain name, installing WordPress, adding security, creating contact forms, integrating with list management programs and more. 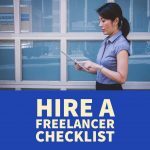 Why do I focus on creating online checklists? Aren’t printed checklists or checklists on your computer just as useful? When my checklist is online, I can access it from any device – from my desktop computer, laptop, tablet or smart phone. No matter what the device I can access it. When I travel, I like that all my checklists are available as well. This lets me be a “digital nomad’ by being able to work from anywhere. So I don’t have to say no to a trip if I have work to do because all my work task lists and online checklists are all there when I need them. 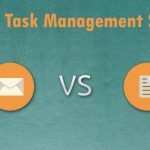 I do sometimes print off a checklist and stroke off each item for a trip, but I find for my business where I want to save my checklist to ensure I completed all the tasks that I prefer to tick off each item on my computer, smart phone or tablet. There are many ways to save and store your online checklist such as Dropbox, OneNote, Evernote, etc. but here are my favourite 2 methods of saving online checklists. OneNote: OneNote is my “knowledge database.” I keep nearly everything it. It is a great place to store my online checklists and it works on all my devices (desktop/tablet/smart phone). 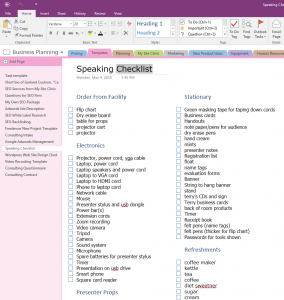 Here is a portion of my speaking/workshop checklist in OneNote (click for larger size). FALSE: Checklists actually help you get more done in less time by eliminating mistakes, reminding you of forgotten steps and making it easy to assign work to others. 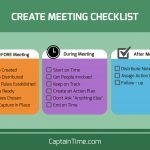 Struggling with creating and using checklists? Contact me and I would be happy to help.